One of the major elements for successful residential landscaping is to determine the amount and quality of light and shade your yard will receive. It’s important to understand that this amount can change over time. As trees and shrubs mature they can cast shadows lowering the duration of sunlight. Seasonal changes also occur. The sun’s trajectory will change throughout the year positioning it differently in the sky. This means light will fall on to different spaces and for longer amounts of time throughout the seasons. Knowing how the sun’s path affects the light exposure on yard is important information. For those parts of your yard that do not benefit from at least five hours of sun each day you will need to consider plant choices that are suited for shade conditions. A good way to determine the various degrees of sun and shade on your property is to take photos at various times of the day – early morning, mid-day and late afternoon. This will indicate how the sun hits the landscape at different times and where shade is the deepest. For successful residential landscaping it is important to choose the right plant for the growing conditions. Native plants are a terrific choice where light is limited. Whether you like a pristine look or a naturalistic cottage setting, there are numerous native shade plants that offer a variety in structure, texture and color. To ensure growing success, all plants need to be placed in the right location. Before purchasing any plant materials, talk to the grower or read the tag to identify zone hardiness, sun requirements, and size. Proper spacing becomes even more significant in shade conditions to avoid creating fungal infections. Mature trees are a valuable component to the North Texas landscape. Along with their natural beauty they deliver oxygen and clean air, help prevent erosion, offer a cooling aspect for your yard and home, and provide a habitat for wildlife. When planning your residential landscaping, consider these popular and hardy shade plants for North Texas. If you determine that the conditions for your residential landscaping will require shade plants, don’t be discouraged. There is beauty well beyond impatiens and begonias. Hanging out in the North Texas shade is much more enjoyable than baking in the sun with the okra and crepe myrtles. Walk yourself through our best options for shade plants and you will find many choices to brighten and beautify your yard. 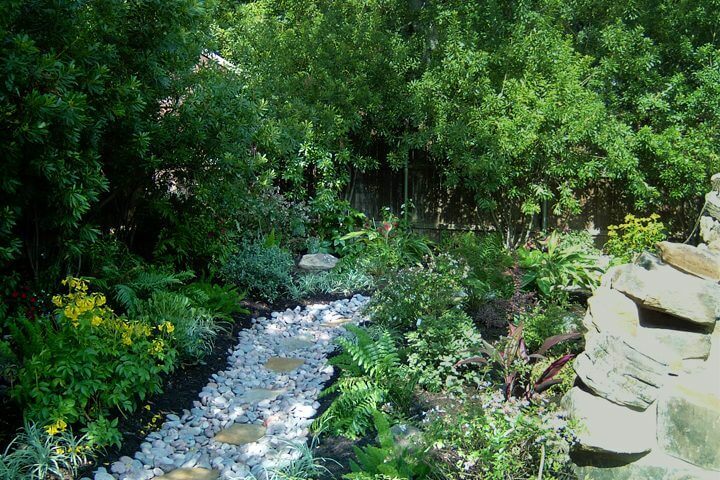 Follow the advice for planting and you will be well on your way to a successful, cool and relaxing shade garden.